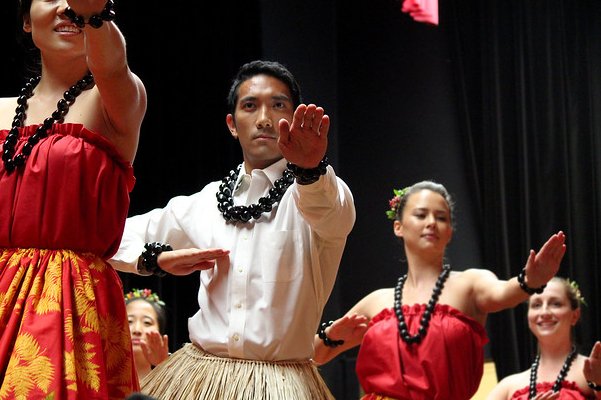 Pictured: Andrew Kinimaka, JABSOM MD 2019, performing at a JABSOM MD Senior Lūʻau in 2016. Amanda Shell photos. Lūʻau. The Kumu Hula says the mele reminds us that Native Hawaiian healing included the scientific and the spiritual dimensions of healing. 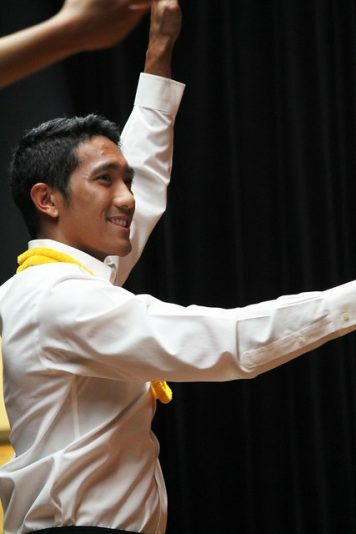 Later this month, fourth-year University of Hawaiʻi medical student Andrew Kinimaka will stand ready to take the stage at the 2019 Merrie Monarch Festival. Sometimes called the Olympics of Hula, Merrie Monarch is a weeklong display of the best of Hawaiʻi‘s traditional storytelling art form. Kinimaka will be dancing with Halau Hiʻiakainamakalehua, a hula group that represents the Native Hawaiian deity Hiʻiaka, the goddess of hula dancers, chant, sorcery and medicine. Its kumu hula are Keano Kaupu and Lono Padilla. Kaupu says he sees parallels between medicine and the mele (the chant or song accompanying hula movements). When Kaupu says “We tend to forget to think Hawaiian,” he means that advances in technology, the rapid pace and conveniences of modern life sometimes obscure the most basic things. Kinimaka dancing a modern or auwana hula in 2016. At the University of Hawaiʻi medical school, students are taught that Native Hawaiian healing practices preceded Western medicine in the Islands. When you tour the campus, you see images of Native Hawaiian healing plants etched into the towering glass windows of the school’s halls or carved into the exterior walls. Inside its clinics, future physicians learn cultural competency, how to respect the traditions and customs of the diverse people they examine and treat and how to communicate more effectively by honoring those people’s unique values. In the school’s laboratories, Native Hawaiian scientists have recently documented early findings* in their research showing that diabetes risk among young people in Hawaiʻi can be significantly reduced by substituting our 21st century lifestyle with the exercise and nutrition available to early Hawaiians — sustainable farming, requiring vigorous work that yields healthy fruits and vegetables. Note: Dr. Kinimaka, as Andrew will be known upon Commencement on May 11, 2019, attended Kamehameha Schools Kapālama. He will begin his residency in Internal Medicine at the Kaiser Permanente Hawaiʻi .